My first celebration has absolutely nothing to do with school, but it has been oh-so-fun!! Friday was our conference comp day so this weekend became a 3 day weekend. I spent the last 36 hours doing some power shopping -- some cute dresses, new boots (thanks to Franki for the inspiration), new yoga attire, a new tree to replace one that had to be removed, and a new console for our television. My credit card hasn't had this much exercise in quite a while!! But the biggest deal of all these things is what I'm typing on right now -- my brand-new MacBook Air. I love the Apple store and the people who teach me so many new things every time I walk in. And I love my new laptop as well! But, on to the true purpose of the Saturday celebration, the part about my students, not me. I was having a writing conference with a student this week. She has been somebody who learned how to avoid writing along the way - she would draw pictures, write notes to friends, and just chat up a storm. That ability to converse is why I knew she had a lot of important things to write about; I just needed her to commit to putting those great ideas down on paper. She had a breakthrough this week. We had spent a great deal of time this past month learning and applying revising and editing skills to help enrich and polish our pieces. With all her newfound skills, she was ready to tackle a new piece. So, during our conference, she shared that she wanted to publish a story one chapter at a time on our KidBlog. Her rationale was she planned to end each chapter with a cliffhanger that would leave the reader wanting more. How cool is that?!! She is thinking and planning like a writer. I can't wait to listen to the "buzz" her installments will produce. I've already read the first chapter and it's a doozy! Classmates will be begging for more. How wonderful for her that she found her writer's identity, and how lucky for the rest of us that we get to take the journey with her. For more celebrations, head on over to Ruth's blog. Have a great weekend! For my celebration this week, I am sharing snippets of oral or written conversation that made my heart sing with joy. I have really enjoyed living in this classroom full of books. Talking to Barbara o Conner she does not act like a famous person. I hope you have had a wonderful week that had at least one celebration in it. Have a great weekend! And don't forget to head over to Ruth's blog to see what others are celebrating!!! Though I haven't posted about it, I have been reading voraciously since school began. The thing about it... I haven't been reading children's books. I have been reading stacks of library books and a huge number of books on my Kindle bookshelf (MasterCard loves me), but most of these books have one thing in common - they are adult reads. The hysterical picture book, Memoirs of a Hamster by Devin Scillian / illustrated by Tim Bowers. Fans of Memoirs of a Goldfish will really enjoy this new book. The hamster is our narrator and he has got great "voice!" But, back on point... Other than these humorous quick reads, I have devoted my reading time to adult reads. I have found great new authors I love -- Kate Morton, for example. And many authors I already enjoyed came out with new books -- Beth Hoffman, Dan Brown, Sandra Brown. 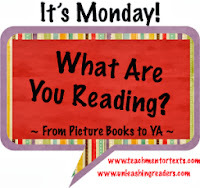 I don't think my adult reading will slow down anytime soon, because on Friday, a friend shared a blog that a colleague (Elaine) from my former school has been writing. 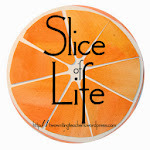 I went to her blog Friday night and it is scrumptious!! Her blog is devoted entirely to adult books she has read. She has great wit, and a wonderful way of spinning the story line so it hooks you (but no more than that). In addition, she is heavily invested in the characters of each story, which is obvious in her reviews. I love characters as well, and she has introduced me to some "new friends" I am dying to meet!! Elaine's blog is The EZ Book Nook; even the title makes me want to cozy up with a book. Check out her blog. Hopefully, you will find some "new friends" you want to meet as well! 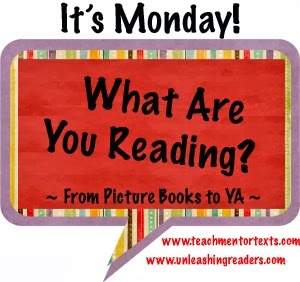 In the meantime, head on over to Teach Mentor Texts where Jen and Kellee are hosting the conversation about children's books that have been read this past week. Ruth continues to be an inspiration for me as a writer time and time again. I love her concept of celebrating a small moment that has given us joy, and then sharing all those moments on Saturday. It's a perfect reason to dust off my laptop, and jot down this event that I've been reliving the past week. What a wonderful way to begin the weekend!! A week ago Friday, our school was engaged in a walking fundraiser for the tigers at our local zoo. The concept is simple -- you are teamed with another class, and you walk together to the Metro Park across the street from our school, and then you walk back. Popsicles for everyone at the end. Donations made by friends and families. A great event. As in past years, this year we were paired with a kindergarten class. To keep tabs on everyone, the kindergarten teacher walked in the front and I walked in the back to take care of those stragglers who are easily distracted by every little thing. One of my boys was paired with an energetic student who just kept running forward to catch the rest of the pack, and then back to us. Instead of running with his partner, my student, T, stayed and chatted with me. He literally talked the entire 1/2 mile to the destination in the park, and then the 1/2 mile back. I was flabbergasted!! This is a student who hardly ever chooses to talk in class. And now, here I am, on a gorgeous fall day, learning so much about T's family, his interests, his activities, and his friends. If we hadn't taken this walk, and he hadn't had such an energetic partner, I might have gone the entire school year without learning as much as I did in that 1 mile walk. This past week, as I greeted him each day, there was a little more purpose in how I greeted him; we now are linked in ways we weren't before. That my friends, brought me joy! Have a great weekend! And sometime, check out some of the other celebrations that others had to share at Ruth's blog! !